okay, so i didn't manage to photograph 95% of my new goodies to show you (yet) but i did snap a quick pic of the ink & spindle fabric that i snapped up from lara and teegs last sunday. my sister and i hit the markit at fed square and were a bit overwhelmed by the amount of talent and goodness packed into one little atrium - sooooooo much amazing stuff. 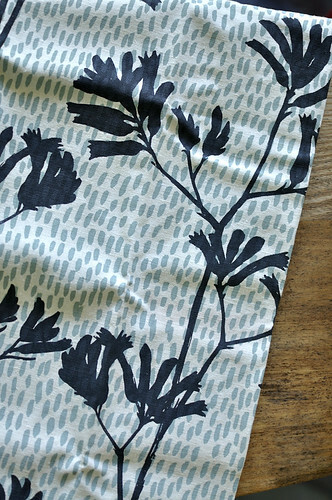 and all i allowed myself was this chunk of lara's kangaroo paw screenprinted fabric. i am the model of restraint sometimes. i like to think i'm restrained in a situation like that.. but really it's that my poor little brain can no longer make decisions in less than about an hour at a time. So totally chuffed that it was my kangaroo paw print that you bought!!! Agreed there was so much amazing stuff. How about those screen printed boxes? WANT! Thanks heaps for the post and the pic lovey!